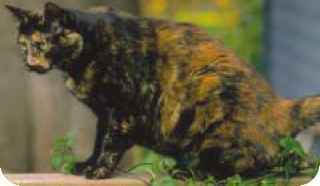 4.18 The patchy distribution of color on tortoiseshell cats results from the random inactivation of one X chromosome in females. two alleles at this locus: X+, which produces nonorange (usually black) fur, and X0, which produces orange fur. Males are hemizygous and thus may be black (X+Y) or orange (X0Y) but not black and orange. (Rare tortoiseshell males can arise from the presence of two X chromosomes, X+X°Y.) Females may be black (X+X+), orange (X0X0), or tortoise-shell (X+X°), the tortoiseshell pattern arising from a patchy mixture of black and orange fur. Each orange patch is a clone of cells derived from an original cell with the black allele inactivated, and each black patch is a clone of cells derived from an original cell with the orange allele inactivated. 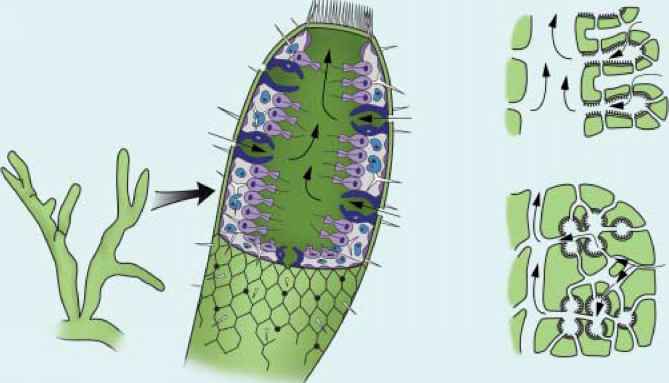 The mosaic pattern of gene expression associated with dosage compensation also produces the patchy distribution of sweat glands in women heterozygous for anhidrotic ecto-dermal dysplasia (see introduction to this chapter). Lyon's hypothesis suggests that the presence of variable numbers of X chromosomes should not be detrimental in mammals, because any X chromosomes beyond one should be inactivated. However, persons with Turner syndrome (XO) differ from normal females, and those with Klinefelter syndrome (XXY) differ from normal males. How do these conditions arise in the face of dosage compensation? The reason may lie partly in the fact that there is a short period of time, very early in development, when all X chromosomes are active. If the number of X chromosomes is abnormal, any X-linked genes expressed during this early period will produce abnormal levels of gene product. Furthermore, the phenotypic abnormalities may arise because some X-linked genes escape inactivation, although how they do so isn't known. (for X inactive-specific transcript) gene, located on the X chromosome, is required for inactivation. Only the copy of XIST on the inactivated X chromosome is expressed, and it continues to be expressed during inactivation (unlike most other genes on the inactivated X chromosome). Interestingly, XIST does not encode a protein; it produces an RNA molecule that binds to the inactivated X chromosome. This binding is thought to prevent the attachment of other proteins that participate in transcription and, in this way, it brings about X inactivation. In mammals, dosage compensation ensures that the same amount of X-linked gene product will be produced in the cells of both males and females. All but one X chromosome is randomly inactivated in each cell; which X chromosome is inactivated is random and varies from cell to cell.